In a closed system, such as an air conditioner, the contents should never be able to escape. You should never need to “recharge” the system, unless refrigerant is somehow lost. From time to time, air conditioner components can spring a leak, or several, requiring repair. While you aren’t likely to visually spot a refrigerant leak, you may realize some other signs which could indicate one. If your cooling system is cycling for longer periods, if the air from your vents feels tepid at best, or if your energy bills have climbed without explanation, a refrigerant leak could be to blame. 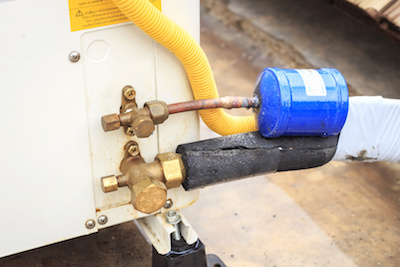 While certainly not the only place leaks can occur, there are three spots where refrigerant leaks commonly pop up. Refrigerant line sets: At the joints or flare connections, refrigerant leaks may form. If the line sets have been damaged by weed eaters or lawn mowers, leaks may result. The line sets may be repaired or replaced to correct the leak. Evaporator coils: The evaporator coils have capillary tubes which can vibrate against each other or other equipment as the cooling system runs. This can cause holes to form, leaking refrigerant. The damaged tubes will need to be replaced to stop leaks. Condenser coils: The U-beds of the coils are joined by tubular sections of sheet metal. Vibrations from operation can cause the components to rub together, forming holes. They may be repaired, or the entire coil may be replaced to fix the leak. If you think your Lexington air conditioner has sprung a refrigerant leak, the system must be repaired to work properly. The NATE-certified air conditioner technicians of Climate Control will recover refrigerant safely and determine where leaks are located. Once repairs are performed, we will recharge the system with proper refrigerants. Contact us today to schedule repairs for refrigerant leaks. Why Does R-22 Refrigerant Cost So Much in Lexington? Which Setting is Right for My Lexington HVAC Fan? Is a Natural Gas Furnace Right for My Lexington Home?